In my last post I commented that Lauren and I hardly ever get to go to the theater. Well, that very night we went to the theater. It wasn’t planned, but Lauren’s mom was kind enough to babysit the boys, so Lauren and I went out to eat and then to catch a movie. Stranger Than Fiction was Lauren’s idea. I was pushing for the new James Bond movie Casino Royale, but I’m glad we went with her vote. STF was fabulous, an easy-paced comedy starring Will Farrell as Harold Crick, an IRS auditor living a rather bland existence. Harold counts his toothbrush strokes every morning, counts his steps to the bus stop every morning, and shuffles around his cublicled office like a zombie on autopilot. Harold is a very boring man. All that changes one morning when Harold begins to hear his life narrated by a voice in his head. That voice belongs to Emma Thompson, a reknowned author battling writer’s block and a nasty nicotine habit. As it turns out, Thompson unknowingly is writing (or perhaps controlling) Harold Crick’s life. She believes she invented the character, but Harold Crick is a real human being, very much alive. Maggie Gyllenhaal plays a young baker being audited by Harold. She, like, Thompson, turns Harold’s life around as he discovers for the first time what love is. The entire cast is fantastic. Queen Latifah does her duty as Thompson’s assistant, not overplaying the role. Thompson is electric and deserves a nomination. Hoffman, like I said, is hilarious and the perfect example of an actor DOING business as he acts. He makes coffee, shuffles papers, eats yogurt — and never in a way that suggests he’s an actor being busy but rather as a literary professor who spends twelve hours of his day in this small office and knows every inch of it by heart. The answer to the latter is yes. Will Farrell can actually act when he wants to. I didn’t see Talledega Nights and probably never will. That Will Farrell doesn’t interest me. 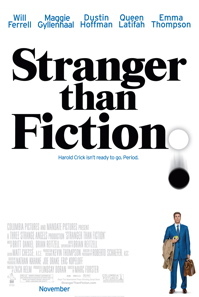 But THIS Will Farrell, the Harold Crick Will Farrell. For him I’ll hire another babysitter and pay big bucks to go to the theater. The person most deserving of praise is Zach Helm, the unknown screenwriter who wrote the script. I’ll be surprised if Helm isn’t nominated also. The script was poetic and honest and even though it had a character who was a writer (without fail the most boring characters in film), the story, dialogue, and building suspense were all first rate. And I can’t forget Marc Forster as well, whose direction made it all possible. Forster directed Finding Neverland, which was wonderful in its own right and probably why Dustin Hoffman was in this one (Hoffman was in Neverland also.) Kudos to you, Mr. Forster. We’ll all be keeping our eyes on you to see what you come up with next.